The NYPD released a cellphone photo of the suspect taken by the victim. BROOKLYLN (WABC) -- Police are searching for the suspect behind a subway attack in Brooklyn. Police say a 26-year-old woman was getting off the G Train at Metropolitan Avenue Oct. 13 when she accidentally bumped into another woman. The victim told officers the suspect began cursing at her..and then tried to choke her but a Good Samaritan stepped in. The victim then proceeded to walk to the L train platform where she sat on a bench. 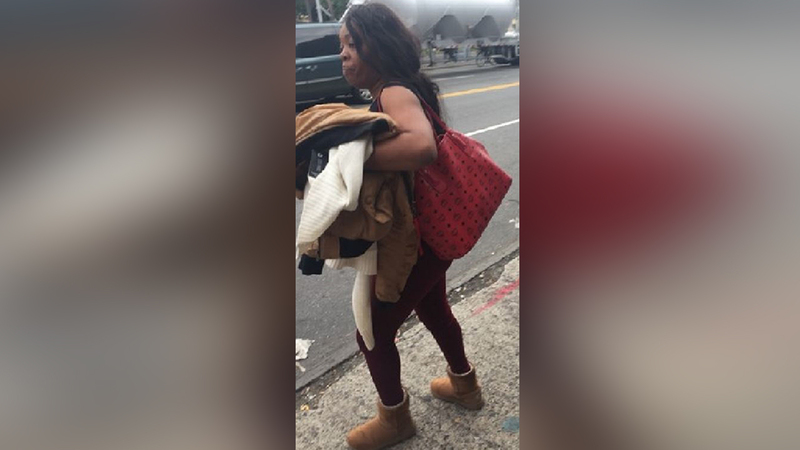 The suspect, who had followed the victim, began to repeatedly punch the victim in the face and kick her in the back, according to the NYPD. The attacker left the scene and entered an unknown vehicle as a passenger and left the scene. The victim sustained a broken nose and bruising to her face, and was removed via EMS to Woodhull Hospital, where she was treated and released. Police describe the suspect as approximately 35-45-years-old, 5'5" tall, 155 pounds, with medium complexion, long black hair, last seen wearing a black tank top, dark red pants and brown boots.